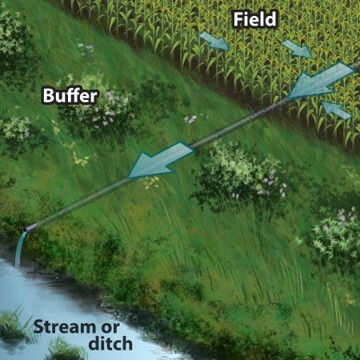 Saturated buffers utilize the organic matter in the soil profile of a vegetated filter strip located between a field edge and a stream to remove nitrogen from tile transported water. To accomplish this a control structure is used to divert a portion of the tile flow into a distribution tile that runs parallel to a stream. To view results from ADMC saturated buffer research please click here. Conventional outlet through a filter strip. Modified outlet for a saturated buffer. The control structure sits on the main near the field edge in the the filter strip. Typical distribution lines run 5oo to 1,000 feet. 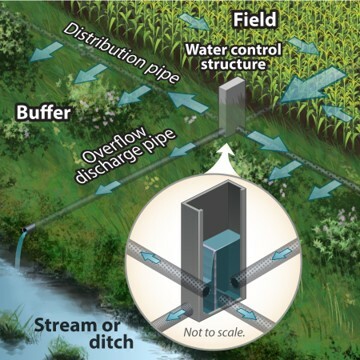 Recent ADMC monitoring showed that saturated buffers removed an average of 33% of the nitrate load. Research by Iowa State University with the USDA-ARS showed saturated buffers removed an average of 44% of the nitrate load. Saturated buffers are eligible for financial assistance through the NRCS EQIP Conservation Practice Standard 604 as well as through the FSA CLEAR initiative. Your state may also have state or private funding available. For more information, please refer to the ADMC Financial Assistance page.